Troves of uniquely framed devotional art. I’ve been digging through some of my old travel photography, being instantly drawn back into past adventures the way rummaging through old photographs allows us to do. When people visit my Dharma Boutique shop they often comment on the smell as they come into the rooms (“Oh, it reminds me of India!”), as so many of the vintage and antique items still possess elements of the aromatic essence of their origin. 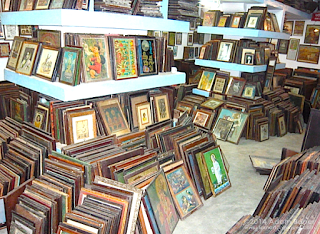 As you enter the big room, on your right is a wall of literally hundreds of framed devotional art prints: antique frames filled with original lithograph prints from the early/mid 1900s, as well awesome reproductions of old hand-painted miniatures. It sometimes takes folks a long time just to make it through the artwork over to the old textiles, clothing and other devotional treasures, but my art collection is still just a fragment of the rooms in Rajasthan—like the basement trove above—where I have found myself hunting for treasures over the years.